Hello, everyone! My name is FitterSpace, and this is the new tool-assisted speedrun for 007: Nightfire. This run was made by myself, Gamerfreak5665, and aleckermit between January 2016 and November 2017. This run features better optimization and more out of bounds glitches, making the gameplay almost 10 minutes faster than the previous run. Note: The previous TAS saved several minutes over console runs due to inaccurate loading times in older versions of Dolphin. While this improvement appears to be about 7 minutes, the gameplay is almost 10 minutes faster. Recent versions of Dolphin have more accurate loading times, but they are still faster than console. This TAS saves 35 seconds over the average GameCube loading times in Nightfire speedruns. Note: This TAS aims for real time instead of in-game time. This TAS plays on the hardest difficulty, 00 Agent. The only major difference between difficulties is the damage you deal and receive. Even though it’s a bit slower because boss fights take longer, I chose 00 Agent because TASvideos generally prefers runs on the hardest difficulty, and it’s the difficulty the previous TAS played on. This TAS uses a different control scheme than the previous run by Gamerfreak5665 and aleckermit. That run uses the “Classic Bond” control style, but this run uses the “Nightfire” control style. The difference between the two is that Classic Bond has move/turn mapped to the control stick and strafe/look mapped to the C-stick. This is very similar to the 1.1 control scheme in Goldeneye: 007, and it was intended to be used by people who preferred moving and aiming with a single analog stick. However, the Nightfire control style is very similar to modern shooters, with move/strafe bound to the control stick and look/turn bound to the C-stick. The advantage here is that you can move with the analog stick and aim with the C-stick, which makes the movement and aiming look much smoother. This game is filled to the brim with awesome glitches such as clipping through walls and getting out of bounds. Clipping is done by standing up at the same time you cycle through your weapons or gadgets, then moving underneath an object you aren’t supposed to stand under (such as a table or chair). When the weapon cycle animation finishes, Bond will stand up inside the object, which causes him to be pushed through the floor. On top of this, it’s also possible to store a clip and use it later. The possibilities are endless. Floors, walls, and objects are non-existent unless James Bond says otherwise. From power on with no memory card inserted, Paris Prelude (the tutorial level) will start automatically. Simply pausing and quitting the level will proceed to the menus, allowing you to skip this mission. In the menus, I change a few settings to my liking. First, I change the control scheme to “Nightfire” as mentioned earlier. Then I turn off “Weapon auto switch”. With this setting on, Bond will automatically equip a weapon if it’s better than the one he’s currently holding. I turned this off because it’s better for me to change weapons manually than letting the game do it on its own. Next, I take a few extra frames to turn on the widescreen setting. Nightfire has excellent widescreen support, and it makes the game look way better. Widescreen also makes it easier to keep a certain NPC on screen in the Double Cross mission, which I’ll talk more about later. After that, I start the first real level in the run on 00 Agent difficulty. The Exchange starts off very straightforward, but gets more complicated as it goes on. For the first minute of the level, the only goal is to get from point A to point B as fast as possible. The fastest way to do this is by strafing forward/left or forward/right. 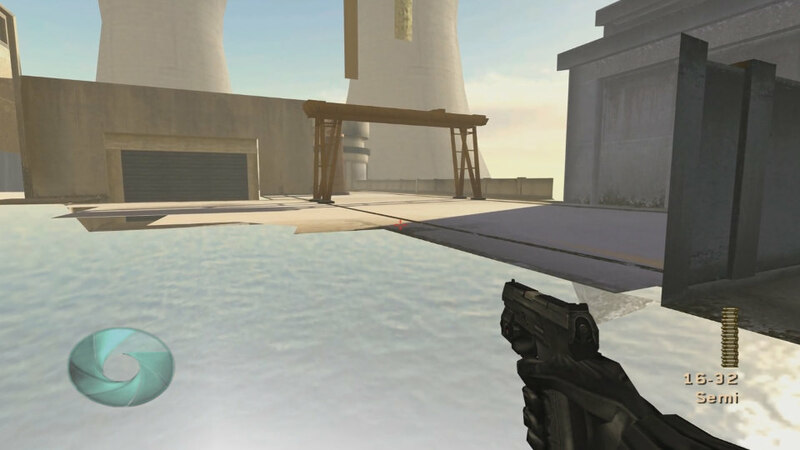 Much like GoldenEye, strafing is way faster than moving straight forward. This continues until I get close to the end of Drake’s Party, which is where I execute the first glitch in the run. After I start the cutscene where Drake talks to the party guests, I’m going to clip through the floor and go straight to the end of this section, skipping the meeting with Dominique and fighting a bunch of guards. The type of clip done here is a bit different than the method I explained above. This is a faster, frame-perfect way of clipping, but its use is limited. For this clip, I crouch, then immediately stand up again while pulling out a gadget. This delays the standing animation by roughly one second. If you press the crouch button again exactly two frames before this delayed animation ends, you will fall halfway through the floor. Then all you have to do is walk into certain objects to push yourself entirely through the floor. In this case, I start the clip, fall halfway through the floor, then walk backwards into a chair that will push me all the way through. This clip saves four seconds over the previous TAS. The last section of The Exchange is the most complicated one. At the start, there are two routes you can take. The previous TAS jumps toward the guards and goes through a series of rooms until it gets to the room with the safe in it. This run, however, takes a slightly faster route by going out the window, then entering the safe room from the outside. This route is about half a second faster than the inside route. When I enter the building, I mash the jump button to go up the stairs a bit faster. When you go up stairs and slopes, you slow down a little bit. But pressing the jump button temporarily puts you back up to full strafing speed. Once I enter the safe room, I immediately go for the body armor. This is necessary for survival. Then I use the laser to melt the hinges on the safe. Contrary to what you might expect, the laser has a very short range. I move while using the laser to make it a bit more entertaining. Once the safe door falls down, I can jump at a precise angle to get pushed through the wall. When an object falls on top of Bond, there’s a chance that it’ll push him away very quickly, and it can sometimes push you through walls. Unfortunately, this is the only place where this technique is useful. It saves hardly any time, but it looks awesome. After getting the Sentinel and the briefcase, I leave the room and head toward the gondola, which is where I rendezvous with Zoe. I have to wait for a little bit before the boss fight starts, so I shoot some enemies and deal damage to Zoe to make the waiting a little more entertaining. The boss fight is a chopper that I need to shoot with 6 rockets. I start shooting the rockets as early as possible so they’ll hit as soon as the chopper spawns. The mission ends as soon as the 6th rocket makes contact. Alpine Escape is an on-rails mission where Zoe drives a snowmobile while Bond shoots enemies with a chaingun/rocket launcher. The first 45 seconds of the mission is completely scripted. During this time, Gamerfreak5665 shoots some enemies and wreaks havoc while Zoe tries to get the snowmobile working. The bad guys don’t stand a chance. It is possible to speed up the snowmobile during the on-rails segments by shooting groups of enemies at specific times. Throughout the level, Zoe will slow down to give Bond time to shoot all the enemies. If you shoot them too early, Zoe will slow down and never speed up again. If you shoot them too late, Zoe will wait longer to speed up again. So this TAS shoots every group of enemies at the perfect time to maximize speed. There are no glitches in this level. This part of the run is all about movement optimization and entertainment, and Gamerfreak did a great job at that. Enemies Vanquished has a major out of bounds glitch that saves over a minute. At the start of the mission, aleckermit does a very optimized drift and starts driving the other way. When he gets to the wall behind the starting point, he shoots rockets to disrupt the road barricades which allow (with RNG) to lift the car’s front end up enough to make it onto the side of the road where you’re not supposed to be. The out of bounds space in the driving levels acts very strangely. Basically, whatever height/angle you’re driving at when you enter empty space will be retained until you go back in-bounds. 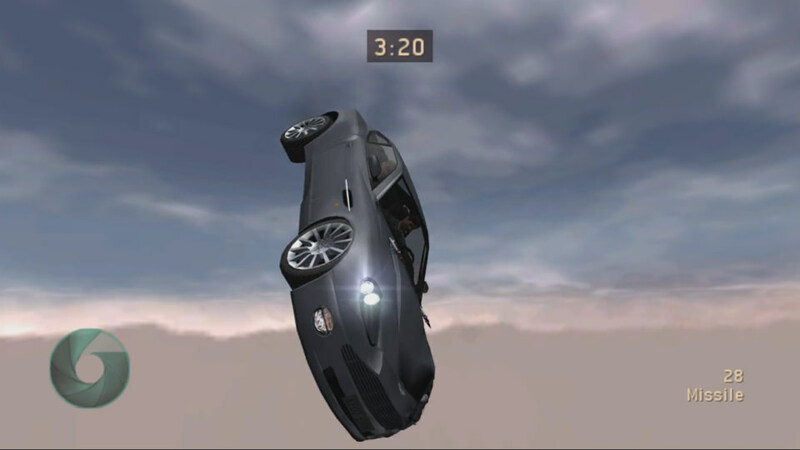 While aleckermit is driving toward the end of the map, the car is tilted downward because that is the angle the car was at before he went out of bounds. This was done on purpose as the loading zone at the end of the map is lower than the spawn point at the start. That way, he will be going down the hill as he goes out of bounds, meaning he will be driving directly toward the loading zone, instead of having to spend 6 seconds dropping vertically onto the load zone as the previous TAS did. The boss fight at the end is rather straightforward. All you have to do is eliminate the enemies as quickly as possible. Double Cross is one of the most complicated levels in the game, even though it doesn’t even have any glitches. There are a lot of unique mechanics in this level such as escorting an NPC, rescuing hostages, and fighting a very luck-based ninja. The first section of Double Cross involves escorting Mayhew to his secret bunker. However, he has a deathly fear of the Yakuza and won’t move until they are taken care of. Mayhew is odd in that he requires some enemies to be dead before he progresses, and others enemies he’s fine with them just being stunned. The first 3 Yakuza to spawn are mostly random. They can spawn in a few different places, but this run gets the best possible spawns. Mayhew will quickly move to the next area once they are killed. This TAS saves seconds over the previous TAS in this section alone because aleckermit discovered that Mayhew moves faster when he is on-screen. However, it’s not possible to keep Mayhew on-screen the whole time, since you have to go to the last room and kill a bunch of guys before he slows down. The widescreen setting saves a small amount of time here since Mayhew stays on-screen for a little bit longer. For the last room in section 1, aleckermit throws some stun grenades to immobilize the remaining enemies. The objectives in sections 2 and 3 are to rescue all the hostages. You don’t have to kill all the enemies in the area to rescue the hostage. You only have to kill the one that’s pointing a gun at them. There are 4 hostages in total. Section 4 is easily the most luck-based part of the entire game. The ninja requires 2 sniper headshots to kill, but he takes reduced damage during his acrobatic animations and also cannot be finished-off during these animations. Most of the time, the ninja will start with a flip, then he’ll attack, then do another flip. These three actions have a few different animations of variable length. As you might expect, this TAS gets the shortest possible animations in each phase. Most commonly, the ninja does a series of backflips when he spawns. However, there is a small chance he’ll do a cartwheel to the side instead. This is very rare, but that’s not an issue for the TAS. When the cartwheel ends, aleckermit shoots the ninja in the face. There are 3 types of attacks the ninja can do next. He can shoot you with his gun, slash you with his sword, or throw a flashbang grenade. The flashbang grenade is the shortest attack, so that’s what this TAS gets. Then he’s luck manipulated to do another cartwheel to the side. Aleckermit kills the ninja after the second cartwheel. In total a few seconds were saved over the previous TAS here. So the whole fight goes like this: Cartwheel, headshot, flashbang, cartwheel, headshot. Alec spent a lot of time manipulating luck in the ninja fight and it certainly paid off. Night Shift is a stealth level that takes place inside the Phoenix Corporation building. There are security guards walking around but Bond is not allowed to kill any of them. Bond is equipped with a dart gun and a stunner to deal with the guards. 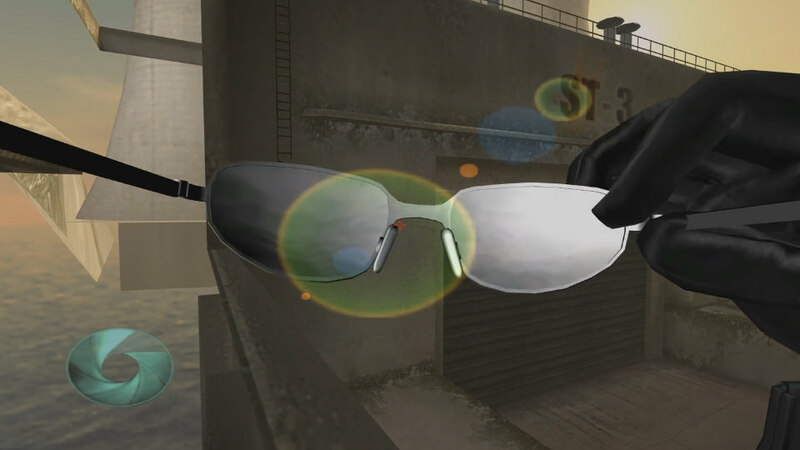 The main goal of this mission is to gather evidence about Operation Nightfire. There are two ways to get to the Phoenix Tower lobby. You can call an elevator or go up the stairs. Going up the stairs is faster because the elevator takes forever. There are two guards along the way, but they are hardly a challenge after what Bond’s been through. In this section, Gamerfreak clips through an elevator door to get a more direct path to the next loading zone compared to the previous TAS, saving about 8 seconds. There are some hidden lasers near the start of the next section (after the loading screen) that cause the alarm to go off. When the alarm goes off, turret guns will open up from the ceiling and shoot at you until you find a place to hide. If you don’t get out of sight quickly, the mission will fail. The next objective is located in a room with no cameras or guards, so Bond can hide from the cameras and turrets long enough to avoid failing the mission. The objective is to install the Q-worm virus on the target computer. After doing this, there are two ways to get to the next area. You can use the decryptor to unlock a bunch of doors to get to the security room, or you can climb into a vent to gain access more quickly. Because this is a video game, we go through the vent. In the making of the previous TAS, Gamerfreak discovered that you can climb through this vent much faster if you crouch before the grapple pulls you up there. Bond will be standing inside the vent with his torso going through the ceiling. This allows him to temporarily move at full speed when you normally wouldn’t be able to. The only remaining objective here is to unlock the door and proceed to the next area. You’re intended to use the decryptor to figure out the code to unlock the door, but the TAS doesn’t need to do that. As long as you know the randomly-generated code, you can simply type it in to unlock the door. In the outdoor area, Gamerfreak shows off a really cool clip that allows him to clip inside the elevator. This allows him to clip inside the building slightly faster than the previous TAS did. There is a new route for the indoor area that saves time over the old TAS. In the back side of the indoor area, there is a computer that takes time to boot up and become accessible. So after opening the door to that room, you have to wait for a few seconds before you can complete that objective. You have to wait for so long that it ends up being faster to open the door before going into the offices, then coming back to complete that objective. However the previous TAS opens that door at a later time, which means more time is spent traveling to and from the office. Opening the door to Mayhew’s office is the only time the decryptor is used in this run. Even if you can figure out the code, it won’t work unless you use the decryptor first. I’m not exactly sure why some doors need the decryptor and some don’t, but I believe it’s because the game generates a code for doors like this when the decryptor is used. There are other places in the game like this, but this is the only one we can’t clip around. After installing the Q-worm virus on Mayhew’s computer, we go back to the other computer mentioned earlier to complete that objective. Then we go to the roof to complete the mission. The only thing left to do is grab the parachute and jump off the building. Clipping through the floor is basically the same as jumping off the roof according to this game. Chain Reaction is commonly referred to as the most broken level in the game. The game’s target time is 20 minutes, but the TAS completes in in just over 1 minute due to several out-of-bounds glitches that skip the majority of the level. At the start of the level, I equip the micro camera and jump down a vent where I take a picture of the jetpack prototype. This is the first of two objectives required in this level. Now the only thing left to do on this map is to get to the door at the end. I do a clip to get out of the building, then I run over to the next building where I do another clip to get inside. This is a really important glitch because it allows me to skip climbing up the guard towers to get inside, saving precious time over the previous TAS. The textures inside the building aren’t loaded, but the collision is still there. The textures will load once I get to a certain point in the building. Section 2 isn’t much different than section 1. You’re intended to kill all the snipers and climb across a cable to get inside the ST-3 warehouse, but that’s really slow. Thankfully, there’s another clip that lets me skip all that. Of course, you can’t have a sniper level without some really cool sniper shots. While I’m turning to get on the seam just outside the level, I no-scope a guy from across the map. Then I quickscope another guy while walking along that seam. All I have to do to load the next area is jump to a specific spot in the out-of-bounds space. The 2nd objective is very similar to the first. I have to take a picture of a laser prototype, then use it to destroy a blast door. It’s possible to clip through the blast door, but destroying it is a required objective. Phoenix Fire is the shortest level in the run because all four sections have clips that lets us save a lot of time. One of the biggest time saves over the previous TAS is in the elevator ride. The old TAS has to wait here for over a minute, but now it’s possible to clip through and fall into the loading zone below. The whole level is over in 40 seconds. The only unfortunate result of finishing so quickly is that there is actually more loading time than gameplay. Thankfully this isn’t true for any other level. Deep Descent serves as a break in the speedrun. Much like Alpine Escape, there are no glitches in this level. The speedrun for Deep Descent revolves almost entirely on optimized driving. This TAS saves 2 seconds over the previous run here due to better optimization. Because this level is long and kinda boring, I did my best to make it entertaining. Turning the camera around while driving past the mines is a hilarious thing Gamerfreak did in the previous TAS, so I did the same thing here. I also shoot some torpedos that narrowly miss some mines just to show off. At the end of the level, I take a little time to grab some body armor before the boss fight. It’s not possible to kill the boss quickly like this on 00 Agent without it. Island Infiltration is another driving level with no glitches, but it’s fast-paced and more action-packed than Deep Descent. The only objective in the driving section is to destroy the three sentinels. Before doing this, I have to download the access code in order to get through the locked gates later in the level. It’s possible to get out of bounds and drive around the gates, but the sentinels won’t spawn unless you use the access code. Near the start of the level, there is an area with a few buildings and a helipad. This is where you have to download the access code. Going into the area, there is a traffic control barrier that alerts the guards when you crash through it. Another consequence of driving through it is that it will slow you down. However, driving through it at a certain angle makes it where the barrier doesn’t slow you down, for some reason. I go to the helipad to download the access code, then turn around just as it finished downloading. Now I can finish the rest of the level. On my way to the first sentinel, there are two armored SUV’s in my way. Killing them is easy, but they will often explode and stop in front of me, which would slow me down. But I was able to get both SUV’s to explode and keep moving away from me. So I kept going at full speed because they didn’t bump into me. After blowing up the first sentinel, I use the access code to open a gate before the next area. This gate takes a few seconds to open up, so I stopped, then drove at full speed through the gate just as it opened. The sentinel just after the gate takes two shots to kill, but I don’t have time to shoot twice. The previous TAS slowed down here to shoot twice, but it turns out you can shoot backwards! Just push the C-stick down to turn the camera around, then you can lock onto targets behind you. So there was no slowing down whatsoever in this TAS, saving several seconds over the old run. The boss fight is simpler than it looks. There is a sentinel in the middle and two SUV’s on either side of it. It’s not possible to survive long enough on 00 Agent to shoot the sentinel with 4 rockets. So I shoot two, grab the body armor, then shoot two more. I also shoot the SUV’s before the screen fades out so they do less damage to me. Section 2 is mostly an autoscroller. Much like Alpine Escape, I shoot enemies at specific times to maximize my speed. Overall, the autoscroller is about 12 seconds faster than the previous TAS. The final section of the level is completely scripted as far as I can tell, so I made it as entertaining as possible. The rest of the level is mostly skipped thanks to a few major glitches. The first is known as “Silo Skip”. As you can probably guess, it allows us to skip most of the silo area. The newer, faster way of Silo Skip used in this TAS allows us to not only get to the end faster, but it also lets us skip using the decryptor to unlock a certain door, which saves a few seconds. After the loading screen at the end of the silo area, I clip past the first door in section 3 to save about half a second over opening the door normally. Then I go up to the 2nd floor so I can clip past a locked door on the other side of the room. This is faster than unlocking the door by a few seconds. After jumping into the hallway on the other side of the locked door, there is only one thing left to do: Kiko Skip. Normally, you’re supposed to proceed through the level as intended and wait in a long and boring scripted scene where Kiko taunts the player repeatedly. You have to wait here for over two minutes. After the two minutes is over, you can press a button to kill Kiko and complete the mission. This button is accessible before the two-minute waiting section but nothing happens when you press it. This is where Kiko Skip comes into play. If you clip around a very specific area in the room before the button, you can press the button before the waiting section and end the level immediately. In that area, there is a trigger that makes it where the button does nothing when you press it. But clipping around this trigger prevents that from happening, allowing us to skip the entire boring two-minute waiting section. It’s really awesome that this works because it made countdown a really entertaining level instead of a really boring level. Equinox is the most straightforward level in the entire run. Besides killing the first two enemies quickly, the whole mission is scripted from start to finish. I spend the next few minutes playing around while stopping the nuclear missiles from launching. I did my best to make it as entertaining as possible. The fastest way to kill Drake at the end is to overcharge the Samurai laser and shoot him as soon as he spawns. A few seconds after he dies, the game is finished. Mothrayas: Excellent shooting action with a nice dose of clipping glitches. Accepting as an improvement to the published movie.